Colleges are encouraging students to get creative with their essays. However, I think students should be careful of trying too hard to showcase their creative writing skills. Rather, I believe they should put those creative writing tools to work to write an engaging, meaningful essay. Some people think creative writing is a goal in itself. They think it’s when a writer gets kind of wild, breaks the conventional English language rules, and cuts loose with what they have to say and how they say it. The essays start to read more like rambling poetry. Instead, the goal is to use creative writing techniques to express yourself better. I advise students to use what is called a narrative style essay to write their personal statement or core application essays. That just means that you write in a story-telling style and voice. In my opinion, this approach injects plenty of creativity into your essay. When you craft an anecdote, you use creative writing tools to re-create and relate a mini-story, or moment or incident, that happened. With “creative non-fiction,” you use sensory and descriptive details to set the scene, snippets of dialogue, bend rules to strike the right tone, write like you talk to find your voice, and wield similes or metaphors only when they strengthen your point. Yes, you can bend the rules–especially when you are telling about something that happened (an anecdote). Just don’t break them only to show you know how. Avoid bizarre formatting or punctuation. Don’t try to force in literary devices just to appear creative. Express your creativity in the topics that you choose to write about, and the ideas and insights you share in your essay. Resist trying to impress with fancy writing. If you start with an anecdote, your essay will have a creative feel to it, but it will still have a structure, flow and meaning. If this helps you visual thinkers out there, these paintings might give you an idea of the creative spectrum. The first is conventional, sticks to the literal and reality. The second is what I would call inspired, in that the artist puts her or his own individuality or expression into it (manipulating light, value, composition, etc.). It’s a unique interpretation of the scene, but you can still recognize what’s in it. The third is abstract, and even though some of us love this style, many have a hard time knowing what to think about it. I believe you should aim for the second type of expression in your college essay–use your creative writing skills to put your mark on what you have to say. It’s still creative, but most people will still know what you are talking about. One caveat: If you want to be a creative writing or poetry major, your essay could certainly be more out there. Just remember who you audience will be. 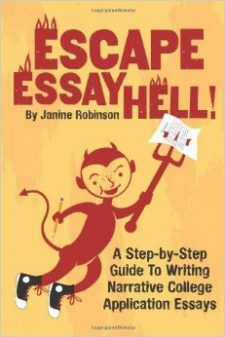 If you want help starting a narrative essay using creative writing techniques, check out my ebook guide, Escape Essay Hell!